Alba Chromy Coat Stand Chrome/Black PMCLASS Pack of 1 Elegant chrome finished coat stand with six coat pegs with rounded tips, four hooks for accessories and one peg with umbrella hanger. Non returnable. 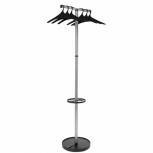 Alba Sevilla Coat Stand Chrome/Black PMSEV Pack of 1 Coat stand with unique and contemporary design. 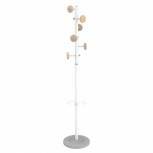 Six rounded coat hooks with four accessory pegs. Integral umbrella holder. Stylish Chrome finish with matt Black pegs. 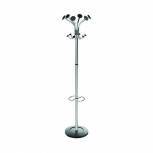 Please note umbrella and jacket are not included.-Height 1750mm. Non returnable. Alba Festival Coat Stand Black PMFESTN Pack of 1 Tubular steel coat stand, elegantly finished in Black. Five rounded coat pegs and one peg with umbrella hanger. Heavy base for high stability. 1870mm high. Non returnable. 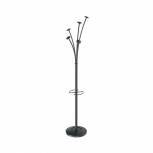 Jemini Black Hat and Coat Stand 306798 Pack of 1 Jemini Hat and Coat Stand. 3 hooks - six hanging points .Assembly time: 45 seconds. Height 1550mm. Base width: 585mm. Contains up to 25% recycled plastic. Black. Non returnable. 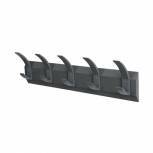 Acorn Wall Mounted Coat Rack With 5 Hooks 319875 Pack of 1 Premium quality wall coat rack with a choice of hooks, coated in a textured graphite finish. Hidden screw and hook fixings provide a modern and slimline appearance. Grey. 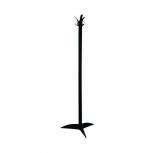 5 hook, width 610mm. Non returnable. 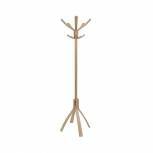 Acorn Wall Mounted Coat Rack With 8 Hooks NW620582 Pack of 1 Acorn Wall Mounted Coat Rack with 8 Hooks NW620582. 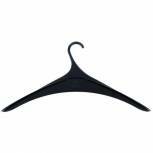 Premium quality wall coat rack with a choice of hooks. Coated in a textured graphite finish. Hidden screw and hook fixings provide a modern and slimline appearance. Black. 8 hook. Non-Returnable. 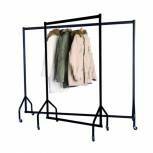 VFM Black Metal Garment Rail with Castors - 311416 Pack of 1 Epoxy coated tubular steel garment rail on castors. Easy to assemble. Coat Hangers not included. L1830 x H1730 x D500mm. Colour - Black. Non returnable. 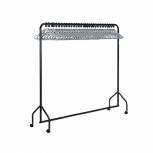 VFM Black Garment Rail With 30 Grey Hangers 311418 Pack of 1 Epoxy coated tubular steel garment rail on castors. Easy to assemble. Supplied complete with 30 Grey Coat Hangers. L1830 x H1730 x D500mm. Colour - Black. Non returnable. 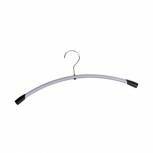 Basic 915mm Garment Hanging Rail 353537 Pack of 1 Basic garment rail fitted with two 50mm castors for mobility. Height 1600mm. Width 915mm. Non returnable. 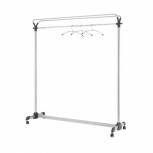 Basic 1220mm Garment Hanging Rail 353538 Pack of 1 Basic garment rail fitted with two 50mm castors for mobility. Height 1600mm. Width 1220mm. Non returnable. 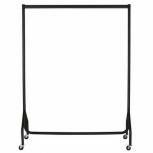 Basic 1525mm Garment Hanging Rail 353539 Pack of 1 Basic garment rail fitted with two 50mm castors for mobility. Height 1600mm. Width 1525mm. Non returnable. 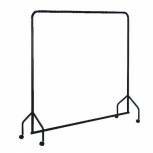 Garment Hanging Rail 2448S Static 366046 Pack of 1 Static rail displays hanging garments. 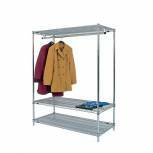 Chrome garment rail attaches simply and quickly to the underside of the wire top shelf. 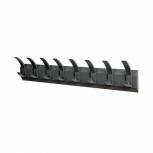 Supplied with 3 shelves and rail. H1590 x W610 x L1219mm. Non returnable.